Mistakes, Errors Patterns, and How Many Chairs? Last week at Twitter Math Camp, Michael Pershan-of www.mathmistakes.org fame- gave a talk entitled Using Mistakes to Inspire Teaching. He began his session with the following statement. “It’s not a waste of time to theorize deeply about student mistakes. In fact, I think it will enrich your teaching. So, give it a shot.” He then asked us to ponder: where do mistakes come from and where, when, and how does an error pattern develop? Such interesting questions to explore. We spend lots of time and energy assuring and reassuring kids that it is “okay to make mistakes”-yet, we all HATE it when we make a mistake. We don’t take much comfort from others saying that it is okay-as long as we learn from it-and all of the other platitudes that are offered. However, it does encourage me to wonder if we should be emphasizing mistakes like we do-turning it into this BIG deal-and that maybe we don’t need to be handling mistakes the way we are. Dr. Johnston says that when you make a mistake, it means nothing more than that. Fix it. Learn from it. So, perhaps we need to take a more low-key, natural approach to mistakes and errors. It is, after all, part of building understanding, part of figuring stuff out, part of learning. To quote Dr. Johnston (again), “errors usually happen at the edge of what we can do, when we are stretching into new territory-when we are learning.” Aren’t errors and mistakes a regular component of everyday life, so maybe we should just treat it as part of what happens-no big deal? Later on in his talk, Michael displayed some students’ work on exponents and his talking points focused on how we might categorize mistakes. He suggested that we think about them from the perspective of a specific response, “as if this were my student, how would I respond?” or through a more general lens, “why do students tend to do this?” All of this builds on the context of his opening statement that theorizing about student mistakes enriches and inspires teaching. So, what if mistakes were just a part of the conversation, the brainstorming, the sharing of ideas, the classroom discourse in a mathematics class? What if errors and mistakes are just what Dr. Johnston says they are? What if they just became part of the learning conversation and the work that we do? They could, in fact, inspire our teaching. Encouraging us to organize instruction to embed the mistakes within the sequence and structure of learning. This in turn offers kids multiple opportunities to build understanding, and ensures entry into the mathematics. They might enrich our teaching by encouraging learning processes to be built in classrooms so that students become accustomed to ideas-those that work and those that don’t work so well-being part of the way learning happens. The use of error patterns could be examined and used to support the understanding and knowledge we want kids to acquire. In light of these ideas, consider the following problem of the day found on page 52 in the publication English Language Learners in the Mathematics Classroom by D. Coggins, D. Kravin, G. Coates, and M. Carroll. HOW MANY CHAIRS? Chairs need to be set up in the multipurpose room for an assembly. In this room, 23 rows of chairs will fit. In each row, 34 chairs will fit. How many chairs will fit in the room? Show how you know in at least two ways. Groups of learners worked on the task and the following is one of the solutions presented during the class conversation. How might the errors and mistake in this solution be used to enrich our teaching? 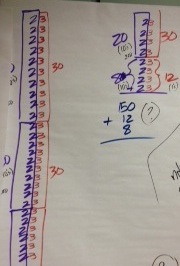 How might we use this to further students’ understanding of multiplication strategies? What role might the errors and mistakes take in the conversation to support understanding? Is this part of an error pattern in the making? Certainly lots to ponder about mistakes and errors, learning and kids, and the importance of our language as we get ready to launch the 2013-2014 school year.